As passionate and excited as we are about bowling here at Lucky66 Bowl, we hardly expect the layman to know everything there is to know about our favorite sport. 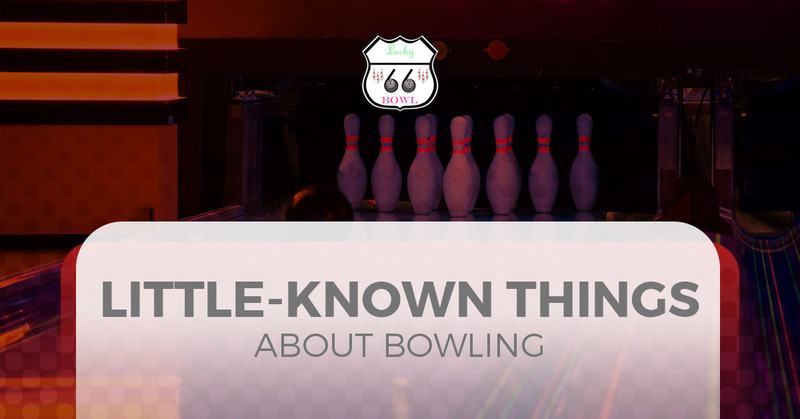 There’s even a number of things that we still don’t know about bowling! In the interest of researching our favorite pastime, our Albuquerque bowling alley is going to cover some little-known things about this activity in today’s blog post. You see, while bowling is a fairly casual fun night out for most people (rightfully so! ), Lucky66 Bowl takes our passion for the game to the next level by looking into bowling a little deeper. If you’re searching for the best bowling deals in Albuquerque, look no further than us! Our bowling center offers bowling kids parties, volleyball tournaments, corporate event planning services, and of course, good ol’ ten pin bowling! Contact our bowling alley in Albuquerque today about joining an exciting bowling league. Now, we’ll spare you the preamble. Let’s take a look at bowling! Wood You Use These Bowling Balls? Before there was plastic, there was rubber, and before there was rubber, there was wood. During the early 1900s, bowling balls were actually made of wood, and later on, heavy rubber became the primary material. Chances are, you’re only familiar with plastic bowling balls with colorful swirls on them. It wasn’t until the 1960s that bowling ball manufacturers used polyester resin for the first time, enabling the production of the plastic bowling balls we know and love today. Think That Your Local Bowling Alley Is Big? At Lucky66 Bowl, we provide plenty of well-maintained lanes for our Albuquerque community to enjoy, but we’re far from the biggest bowling center there is. Of all places, Japan is actually home to the largest bowling alley in the world. The Inazawa Grand Bowling Centre boasts an impressive 116 lanes! That’s quite a few pins falling down at any given time. Las Vegas is home to the second largest bowling alley in the world, and in Reno, they actually have their own bowling stadium. It’s fair to say that people take bowling quite seriously around the world. Even if you’ve visited multiple bowling alleys in your life, you’ve most likely played ten-pin bowling. Why? Well, not only is bowling with nine pins a little bit strange (and literally odd), but as it turns out, nine-pin bowling is actually banned in every state except for Texas since the 1830s. People really like even numbers, so it makes sense when you think about it. There’s nothing quite like the rush of bowling a strike, except when you happen to do it three times in a row. This earns you a “turkey” during your game, but did you know that nine strikes in a row is a “golden turkey”? It’s true! Though quite rare and indicative of a near-perfect game, golden turkeys do happen. Come On Down To Lucky66 Bowl! Don’t worry; our Albuquerque bowling alley isn’t going to quiz you on these fun facts before you start your games. Our only expectation is that you have a good time! If you have any questions about bowling party ideas, getting involved in a bowling league in Albuquerque, or you just want to chat, get in touch with us today.